Before county organization, the earliest settlement in what is now Calhoun County was Linnville, which was established in 1831, and it soon became an important port. After the disastrous Council House Fight in San Antonio in March of 1840, where many Comanche Indians were killed during supposed peace talks, the Comanches raided the towns of Victoria and Linnville in August of that year, resulting in the destruction of Linnville. The town�s residents fled three and a half miles southwest to a small settlement that was eventually named Lavaca in 1841. Meaning �the cow� in Spanish, the name Lavaca reflected the importance that cattle would have on the local economy. In 1844, German settlers, led by Prince Carl of Solms-Braunfels, arrived at Indian Point and built a tent-city, initially called Karlshafen, which was set up to welcome other German settlers that were bound for German settlements further inland. As the settlement grew, the name was changed to Indianola in 1849. 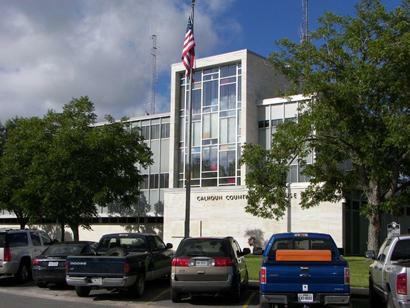 Calhoun County was officially organized in 1846, named for John C. Calhoun, a South Carolina politician who advocated Texas statehood and the United States vice president under John Quincy Adams and Andrew Jackson. Lavaca was named the county seat and the first courthouse was built there the same year. However, the rapid population growth and importance of Indianola as a port and transportation center led county residents to move the county seat there in 1852. The second county courthouse, built of shell concrete and lime, was completed in Indianola in 1857 (1859 according to the granite marker at the site) and designed by architect Edward Beaumont. As Indianola grew, Lavaca�s population declined, but the citizens managed to steal the county seat title away from Indianola during the Civil War in 1864, claiming that county officials there swore allegiance to the Union while Federal troops occupied the city. Indianola retained their county seat status the following year. 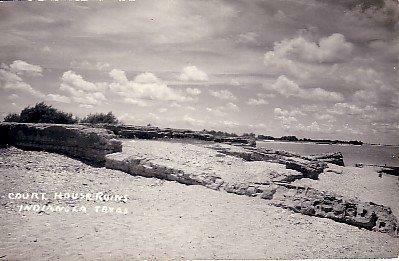 Lavaca continued to decline, suffering great damage after a hurricane on September 16, 1875 which also devastated Indianola. Another hurricane on August 20, 1886 practically obliterated Indianola and the town was abandoned. 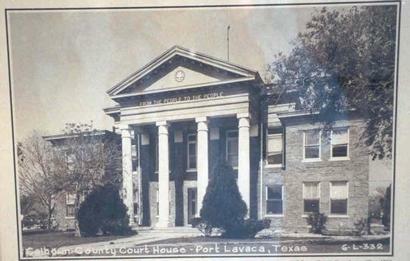 The county seat was moved in 1887 to Lavaca which then became known as Port Lavaca. Today, a large red granite rock near the end of S. Ocean Drive in Indianola marks the location of the former courthouse. 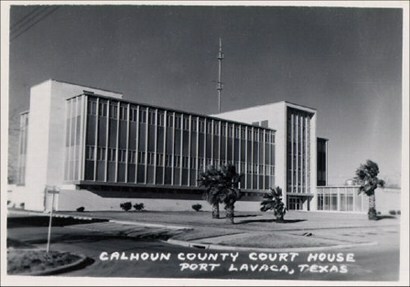 The third Calhoun County courthouse was completed in 1887 in Port Lavaca and was built by E.L. Miller on the grounds of the current courthouse. It was a 50� x 50� frame building built in the Greek Revival style popular in Texas after the Civil War, but it had additional embellishments, such as iron cresting in the center of the hipped roof and angular heads above the doors and windows. The county outgrew this courthouse quickly and the fourth courthouse was under construction by 1910. Completed in 1911, it was built by the Falls City Construction Company and designed by the Chamberlain and Co. architectural firm, who also designed the 1910 Deaf Smith County courthouse and the 1911 San Saba County courthouse. 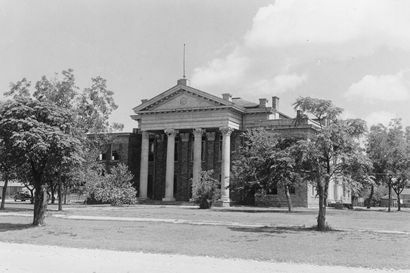 The brick courthouse contained Classical Revival style elements such as a projecting portico with four columns, frieze and pediment and paired columns on the sides. The architectural style of this building was also referred to as Texas Renaissance in that it utilized Texas symbols such as the Lone Star in the center of its pediment. The frieze also contained the inscription �From the People to the People� which is also found in the frieze of the courthouse in San Saba. 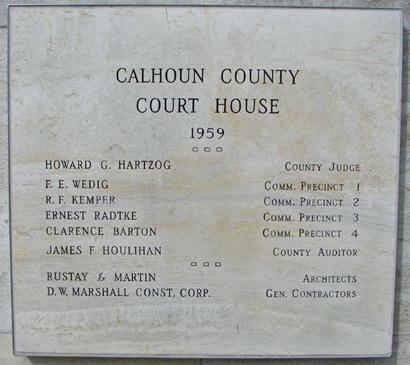 This courthouse stood until 1959 when the fifth and current Calhoun County courthouse was constructed. 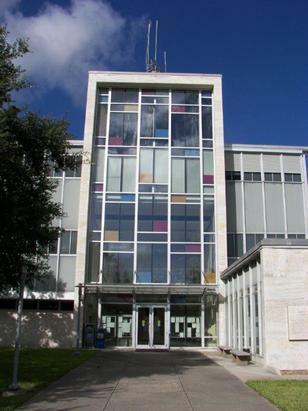 This Modern style courthouse was designed by Houston architects Rustay and Martin and built by the D. W. Marshall Construction Corporation using concrete, steel and aluminum. The long facades of aluminum and glass indicate the interior office spaces with a vertical tower announcing the entrance. 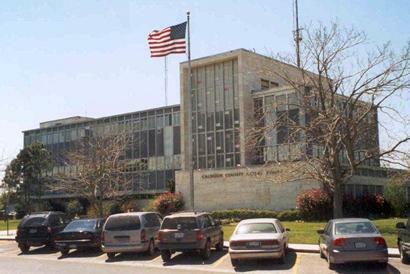 This courthouse contained a jail on the top floor which was used until it was shut down by the Texas Commission on Jail Standards in 2001, forcing the county to house inmates in other counties. The discovery of a health-threatening mold in the courthouse led to a renovation in 2005 and 2006 during which the interior was gutted. A new 144-bed jail behind the courthouse was also being built at that time and opened in 2006. Sources: The Handbook of Texas Online; The Texas Historical Commission�s County Atlas at http://atlas.thc.state.tx.us/shell-county.htm; The World Almanac and Book of Facts; The People�s Architecture: Texas Courthouses, Jails, and Municipal Buildings by Willard B. Robinson, 1983; The Courthouses of Texas by Mavis P.Kelsey Sr. and Donald H. Dyal, 2nd edition, 2007; Calhoun County: Images of America by George Anne Cormier and the Calhoun County Museum, 2013; The Victoria Advocate, �Calhoun County moving forward on new jail, courthouse renovation� by Louise Popplewell, March 7, 2003; The Victoria Advocate, �Calhoun courthouse emptied out so renovations can begin� by Louise Popplewell, June 16, 2005. Material - concrete, steel, aluminum. "Built by Falls City Construction Company. 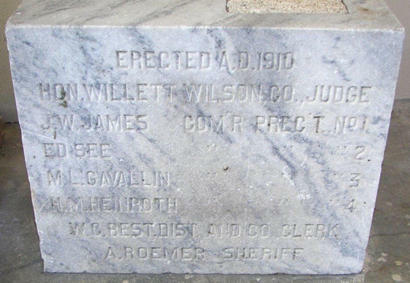 Accepted as complete by the Commissioner�s Court on May 10, 1911"
Cornerstone of the 1911 Calhoun County courthouse at the entrance to the Calhoun County Museum. "This photo of the 1911 Calhoun County courthouse (taken c.1911) is on display in the lobby of the current courthouse." "Built by E. L Miller. The Calhoun County jail building can be seen in the left background." 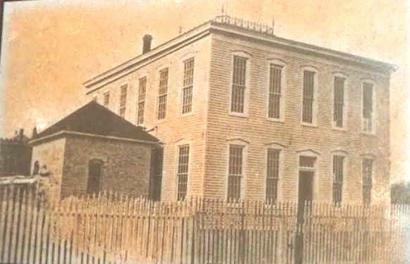 "This photo of the 1887 Calhoun County courthouse in Port Lavaca is hanging in the second floor lobby of the current courthouse."